C urse my mercilessly unfunky hide for not diggin’ this trip earlier. 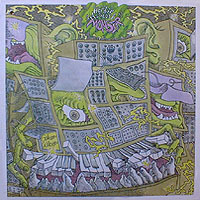 Granted the post Head Hunters funk forays became bread hunters, in search of commercial success as much as a smart groove that would meet in the middle of mind and booty, but it seems I disposed of Monster too early. 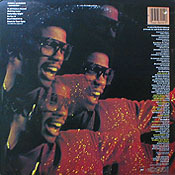 The album’s title might well take its name from the hybrid experiments on hand here: Latin jazz and disco/funk fused together for “Saturday Night” (including a frenetic solo from Carlos Santana), romantic soul slipped into “Making Love,” smartalecky synthetic kicks mix in with “Go For It” to prefigure bands like Was (Not Was). And then there’s the majestic Wah Wah Watson laying it down with a liquid glide on “Don’t Hold It In.” That track and the winning “Stars In Your Eyes” (which invites comparison to Boz Scagg’s “Lowdown”) are Monster’s high moments, though oddly neither was selected as one of three singles that Monster spawned. Sure, I’m a little creeped out by the fact that producer David Rubinson and associate producer Jeffrey Cohen get so much of the songwriting credit; maybe Monster is a machine. But Hancock and his cohorts have far too much talent to slip into a tired genre exercise. And who’s to say that Latin jazz is a respectable medium (Chick Corea) and funk isn’t? True, Monster may scare off jazz purists, as much as Feets Don’t Fail Me Now might send them running. And Carlos Santana fans can save their money, since the solo is only so-so. Monster’s admirers will be those who think jazz, funk, disco and pop can all swim in the same pool, in which case you may want to dive right in.